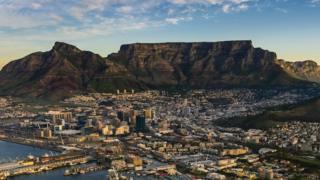 The bodies of a tourist and his guide have been recovered from South Africa's Table Mountain following an accident which trapped hundreds of people at the top of the popular attraction. The man, his local guide and a second tourist are reported to have been using ropes to scale the front of the Cape Town mountain when they fell on Monday. Rescuers then used the cable car to reach the surviving climber. But the bodies were not recovered until first light on Tuesday. The tourists are understood to be of Asian origin while the guide was a South African, a spokeswoman for South Africa's Sanparks, which runs the country's national parks, told the BBC. According to Table Mountain Cableway, the service - which takes thousands of people up and down the mountain every day - was out of action for about four hours, closing an hour after the group was first spotted. John Marais, of Wilderness Search and Rescue, told South African news site TimesLive the two climbers were seen "dangling" on ropes about 150m (490ft) below the cable car station just after 17:00 local time (15:00 GMT). Mr Marais said an initial attempt to use a helicopter to rescue the climbers was unsuccessful, leading the team to decide that the best way to reach the three would be to abseil from the cable car. But they were only able to rescue the surviving woman on Monday evening, with the cable car resuming its service at around 22:15 local time (20:00 GMT), when there were still about 500 people at the top of the mountain. The last people were brought down at 00:33, the cableway said in a statement. The recovery operation, which involved 30 people, continued throughout the night until just after 05:00 on Tuesday. An investigation into the circumstances surrounding the deaths is under way, but local media reports the ropes had not broken. According to the South African Mountain Accident Database, 133 people have died on Table Mountain since 1980.